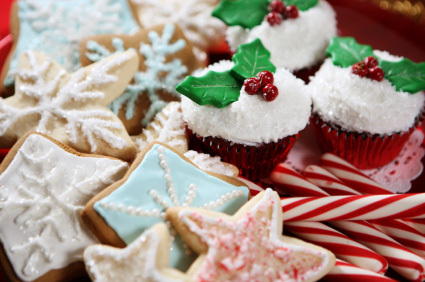 Avoid holiday weight gain with a simple strategy. You can control holiday eating, continue to lose belly fat, and still have fun. Say goodbye to weight gain over the holidays. The months of November and December can be very tough when you are working on making changes in your lifelong eating habits. Let's be real. The majority of holiday social functions are centered around food. There are celebrations, get-togethers, and simple invitations to come by a neighbor's home just to sample a cookie recipe. Television commercials are filled with people laughing and enjoying themselves with food trays on every table. And, to top it off the smells of cookie dough, hot chocolate, and baked goods seem to surround you. ** Avoid holiday weight gain by making the months of November and December your personal time period to achieve your best results. * You will gradually elevate the intensity of your workouts each week. * You will seek to develop more social skills than those used to sit around a basket of warm Christmas cookies. Will it be tough? For some people it will be very difficult, especially if you recently started to change to a more positive lifestyle. The smells of high-fat baked goods is powerful...and they taste even better. However, what health benefits are there to eating those items? The one sure thing you know about high-fat/high-carb/high-calories foods and drinks are that they taste great and they are the most easily converted to fat on your face, waist, and hips. Keep in mind that weight loss success stories for women are the result of taking back your power and overcoming old habits. Many women follow a proven nutritional plan like the Diet Solution Program. It has helped thousands of women meet the challenges that threaten their weight loss goals. Let's face it, you are going to be "tested" during the holidays, so the best thing to do is plan ahead so you will have strategies to defeat the obstacles that get thrown up at you. Your challenges will come from three areas: the holiday spirit...friends and social situations...and your own emotions. Here are a few samples of things that might come up and how to handle them. You will thing of others. There will be lots of food: Eat before you go. An apple and a solid protein source like warm turkey will make you feel full. There is lots of food at this party: Fill your paper plate with vegetable cuts, fresh holiday fruit, and some solid protein sources. Stay away from grains and baked goods. It all smells so good! : There is nothing wrong with sampling a cookie or a brownie at a holiday party. Just make sure it will be only ONE. Choose wisely. "Are you on a diet? You need to live a little! ": Do not be guilted into anything. Think through a gracious response beforehand. It's okay to have a cheat day: Sorry, this one was manufactured by fat men who have poor self-control. It is not okay to blow a week...because you are weak. Avoid holiday weight gain by avoiding nonsense. Holidays get me down: You are the expert on you. Know when emotions/hurt feelings are pushing you to medicate them with food. * Get the mindset that this will be the healthiest part of your year! * Try one new natural food/recipe every other week with a friend. Make it a fun experience. * Set a goal to learn two new facts about nutrition each week. Keep them on a list where you can review them daily. * Substitute one new strength training exercise for another each week. * Change one cardio workout each week. Try a Zumba or Spinning class. * Go to bed 30 minutes earlier. * Drink an extra glass of water before noon and after noon each day for this two month period. * Do something new with the most positive, health-conscious people you know each weekend. Make plans. * Congratulate yourself as often as possible. If you happen to slip up, no big deal. Learn from these instances. NEVER beat yourself up. You can make good decisions in the months heading into the New Year. 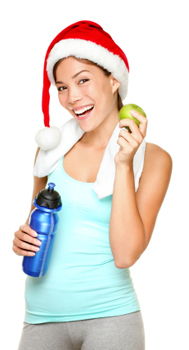 Holiday weight gain does not have to be a part of your life any longer.